One official said "a few more" Army deaths were being investigated as possible suicides, and the Navy said the death of one service member was under investigation. The Air Force said it had no such cases. 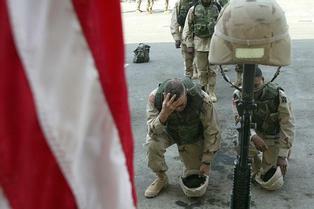 Army officials have expressed concern about the suicides, many of which occurred after President Bush declared major combat operations over in Iraq on May 1. A 12-person Mental Health Advisory Team dispatched by the Army recently left Iraq after studying a wide range of mental health concerns, including suicide, among U.S. troops facing combat stress and longer-than-expected deployments. The 130,000 U.S. troops in Iraq are facing yearlong stints amid daily guerrilla-style attacks. Lt. Col. Jerry Swanner, the Army's suicide-prevention program manager at the Pentagon, was a member of the team, said Martha Rudd, an Army spokeswoman. "Of course we're concerned," Rudd said. "Even one suicide is alarming and upsetting." The suicide deaths are included among the 120 U.S. troops who have died in "non-hostile" circumstances in Iraq in the past seven months, mostly vehicle and other types of accidents. Another 212 U.S. troops have died from enemy fire, according to the Pentagon. "When war is actually going on, behavioral experts say the soldiers aren't as likely to commit suicide during that period. While they're fighting, they're not thinking about their problems. But once open hostilities cease and the peacekeeping part begins, for some soldiers that can be very rewarding work but for some (others) it can be very stressful," Rudd said. She also noted that troops in Iraq have guns readily available, enabling them to act on what otherwise might have been a fleeting suicidal impulse. The team sent to Iraq included psychiatrists, psychologists, social workers and experts in combat stress, said Lyn Kukral, a spokeswoman for the Office of the Army Surgeon General and the Army Medical Command. The team was expected to complete a report on its findings and make recommendations in two to three weeks, officials said. "Suicide is just one aspect of many behavioral health and individual readiness issues that the team is assessing. The team is interested in identifying particular deployment stressors and their impact on the deployed soldiers. The team is also concerned with reviewing the effectiveness of current combat-stress control doctrine," Kukral said in a statement. Kukral said 478 soldiers had been evacuated from Iraq for mental health reasons as of Sept. 25. The Army and Navy annually average about 11 suicides per 100,000 personnel, the Air Force about 9.5 per 100,000 and the Marines about 12.6 per 100,000. Referring to the Army rate, Rudd said, "I don't think the suicides we've had in Iraq are going to seriously skew the numbers."